A scientist at Rensselaer Polytechnic Institute and an anthropologist from theUniversity at Albany teamed up to use ultra-modern chemical analysis technology at Rensselaer to analyze ancient Mayan pottery for proof of tobacco use in the ancient culture. Dmitri Zagorevski, director of the Proteomics Core in the Center for Biotechnology and Interdisciplinary Studies(CBIS) at Rensselaer, and Jennifer Loughmiller-Newman, a doctoral candidate at the University at Albany, have discovered the first physical evidence of tobacco in a Mayan container. Their discovery represents new evidence on the ancient use of tobacco in the Mayan culture and a new method to understand the ancient roots of tobacco use in the Americas. 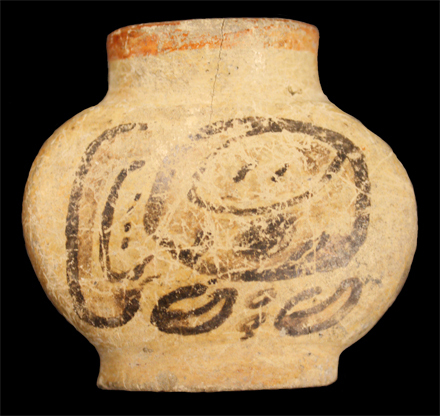 The approximately two-and-a-half-inch wide and high clay vessel bears Mayan hieroglyphics, reading “the home of his/her tobacco.” The vessel, part of the large Kislak Collection housed at the Library of Congress, was made around 700 A.D. in the region of the Mirador Basin, in Southern Campeche, Mexico, during the Classic Mayan period. Tobacco use has long been associated with the Mayans, thanks to previously deciphered hieroglyphics and illustrations showing smoking gods and people, but physical evidence of the activity is exceptionally limited, according to the researchers. Zagorevski used the technology within CBIS at Rensselaer, usually reserved to study modern diseases and proteins, to analyze the contents of the vessel for the chemical fingerprint of tobacco. The technology included gas chromatography mass spectrometry (GCMS) and high-performance liquid chromatography mass spectrometry (LCMS). Both are analytical chemistry techniques that combine the physical separation capabilities of gas or liquid chromatography with the analysis capabilities of mass spectrometry. The latter is used to determine molecular weights of compounds, their elemental composition, and structural characteristics. Zagorevski and Loughmiller-Newman’s analysis of the vessel found nicotine, an important component of tobacco in residues scrapped from the container. Both techniques confirmed the presence of nicotine. In addition, three oxidation products of nicotine were also discovered. Nicotine oxidation occurs naturally as the nicotine in tobacco is exposed to air and bacteria. None of the nicotine byproducts associated with the smoking of tobacco were found in the vessel, indicating that the vessel housed unsmoked tobacco leaves (possibly powered tobacco) and was not used as an ash tray. No other evidence of nicotine has been found, at this time, in any of the other vessels in the collection. This discovery “provides rare and unequivocal evidence for agreement between a vessel’s actual content and a specific ichnographic or hieroglyphic representation of that content (on the same vessel),” Loughmiller-Newman states in the paper. She is in the anthropology department at the University at Albany, studying ritual food stuff consumed by the Mayans. Both Loughmiller-Newman and Zagorevski would like to see this technique used to analyze a greater variety of vessel types.